I began my musical studies in the elementary school band program at my local public school when I was in fourth grade. 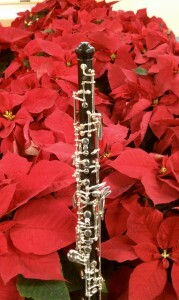 My desire to play the oboe was thwarted by a high interest in the instrument, so I began my studies on the flute. I switched to the oboe my sophomore year in high school, after the other students had moved on to other things, and have been playing since. I enjoy playing all sorts of music, from the Renaissance through the modern, from chamber ensembles and orchestral pieces to musical theater. I’ve played in the pit for many community theater performances both in Falmouth and back home in Connecticut, including Fiddler on the Roof, Nine, Once Upon a Mattress, Carousel, and Music Man. As an undergraduate, I played in the Wind Symphony and Wind Ensemble at Cornell University before moving to the Cape. I am currently playing with the Falmouth Chamber Players Orchestra and the Brockton Symphony, as well as many local small ensembles. Check out their websites for our concert schedules!